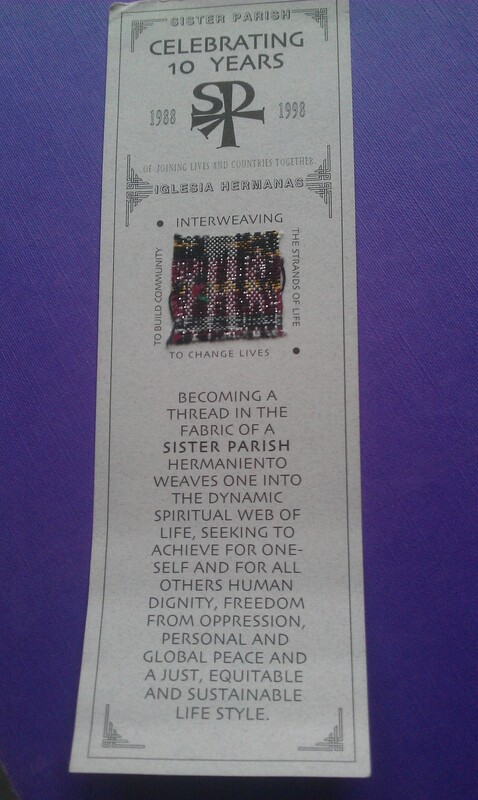 becoming a thread in the fabric of a Sister Parish hermanamiento weaves one into the dynamic spiritual web of life, seeking to achieve for oneself and for all others human dignity, freedom from oppression, personal and global peace and a just, equitable and sustainable lifestyle. 15 years later, I think this is more important than ever as our societies have become more individualistic and less community oriented and as we still seek the same dignity, peace and justice for all. How valuable is the Sister Parish experience for connecting people who would not usually meet! I was privileged enough to be a “weaver” of these threads for 9 years (between 1992 and 2001) and am so glad to see that these relationships are still going strong and still changing lives! This entry was posted in 25th Anniversary, General and tagged 25th anniversary, staff reflection. Bookmark the permalink. Sister Parish has made such a powerful impact on my life and on the lives of so many others. I am indeed grateful that I have been a part of this wonderful organization! Thank you Jackie and Walter for your part in the life and development of Sister Parish.